A few days before the lecture, Radio Contact Station, the largest station in Brussels, broadcast Master's harp compositions during the lecture and art exhibition announcements that were made many times during the programming. Master's heavenly musical compositions thus resounded through the supermarkets, grocery stores, households, and automobiles of Brussels. Master's boundless love embraced the city even before She personally arrived to deliver the lecture. Talking about this good idea, brother Huang, then a student in Belgium was still excited. "The whole city bathed in Master's music and was cleansed. All of us delighted in Her bountiful grace." At that time, Belgium was the center for the distribution of Master's books to other European countries. Transporting the tons of sample books thus became an indispensable part of the preparations for Master's lectures. For two years, brother Huang had been driving back and forth between major cities of Europe to distribute sample booklets and had familiarized himself with all the European highways and border regulations. Thus, he naturally became the one who took charge of transporting Master's books to each lecture site. 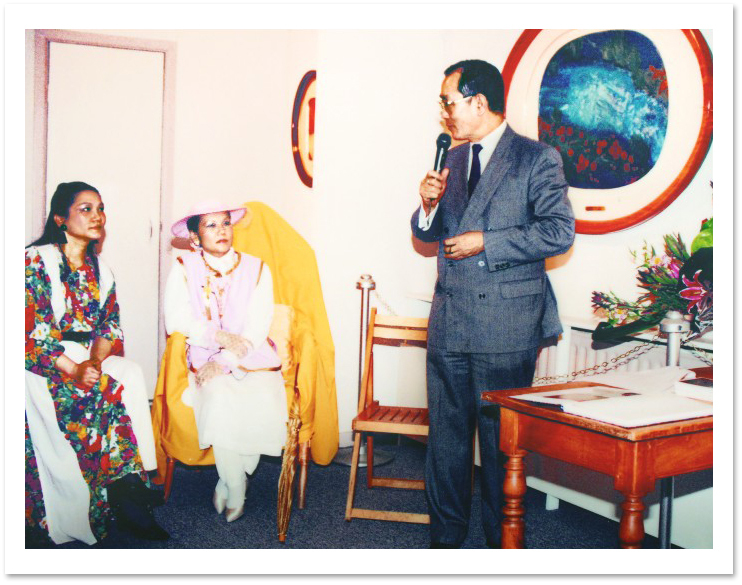 Recalling his adventures, brother Huang said: "One and a half containers, which carried more than a thousand boxes of sample books, arrived at the airport in Austria. Within only a few hours, a sister initiate and I had loaded them onto a truck. The airport personnel were astounded, especially when they saw that the heavy load nearly made the truck lie on its stomach. The sister and I were also nearly flattened on the ground. Then I set off on the road, driving the truck from one city to the next. As Master and Her entourage were flying in the air, I was racing with them on the ground. At the same time, two work teams were also heading toward the lecture site, like two running feet that were carrying the Godhead."